UCLA International Institute, June 10, 2014 — With the World Cup a couple days away, the world’s eyes are on Brazil as the nation prepares to host the sport’s biggest tournament. 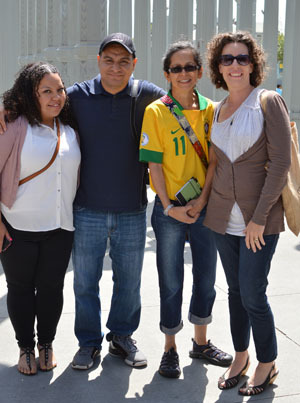 Rita Santos-Oyama, a second-grade teacher at Catskill Elementary School in Carson will be watching the games with “a more critical eye” as a result of her participation in a two-day educator seminar organized by the UCLA Latin American Institute (LAI). 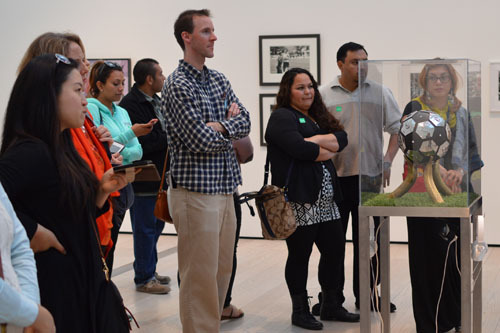 Funded by a Title VI federal grant of the U.S. Department of Education and cosponsored by the UCLA Center for Brazilian Studies, the seminar — held over two Saturdays in April — included guest presentations by leading soccer experts and culminated with a guided visit to the Los Angeles County Museum of Art exhibition Fútbol: The Beautiful Game. The seminar capitalized on the fact that the 2014 World Cup is being held in a Latin American country. 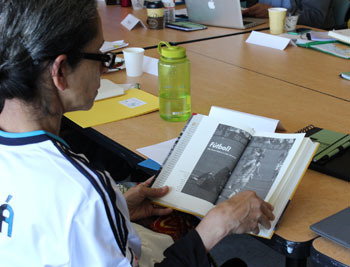 The event provided primary and secondary teachers with a unique opportunity to learn how to approach topics such as politics, economics and globalization through the lens of soccer. Santos-Oyama, an avid soccer fan and native of Brazil who has been teaching for 27 years, admits that she was initially skeptical about how much material she would be able to take back to her classroom. Yet she was quickly impressed with the numerous ways she learned she could creatively incorporate information throughout the second grade curriculum. The history of soccer (known as "fútbol" in Spanish, "futebol in Portuguese" and referred to as "football" in English speaking countries outside the U.S. and Canada), has its origins in England and Scotland. The sport spread throughout the English colonies in the mid-1800s, becoming a route to the world and a link between diverse cultures. David Goldblatt, a renowned soccer scholar and journalist based out of England who was a featured instructor at the seminar, emphasized that any ideas that attribute the origins of modern soccer differently are simply not true. “It’s a good imperial legacy. . . as far as imperial legacies go,” he stated. Goldblatt, who was a visiting professor at Pitzer College during the spring 2014 semester, is the author of both The Ball Is Round: A Global History of Soccer, and the recently published Futebol Nation: The Story of Brazil through Soccer. 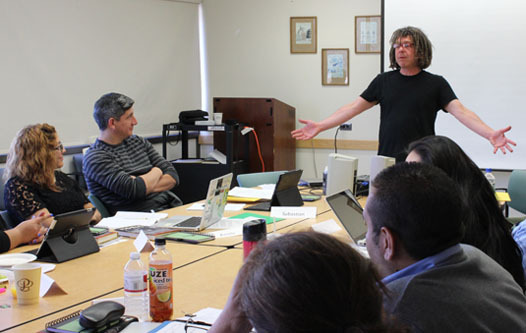 An energetic and charismatic speaker, Goldblatt captivated the group of teachers during his presentations and recounted how he came to write such “ridiculously long” books about politics and football. Goldblatt went on to explain how Brazil hosting the 2014 World cup and the 2016 Olympic Games reflects “the shifting of global power and world order,” arguing that these events confirm the rise of the Global South. It was clear that the teachers were completely engaged with Goldblatt’s illustration of world relations through the history of soccer. 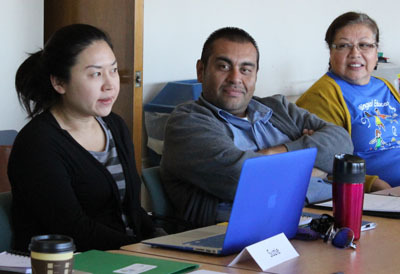 The bigger challenge was how the educators would captivate their own students and engage them in complex global issues. After the first seminar session, Suzie Ahn, who teaches sixth grade at Nueva Vista Elementary in the city of Bell, shared the news of her participation with her students. They were “intrigued that their teacher would take such a course,” she shared. 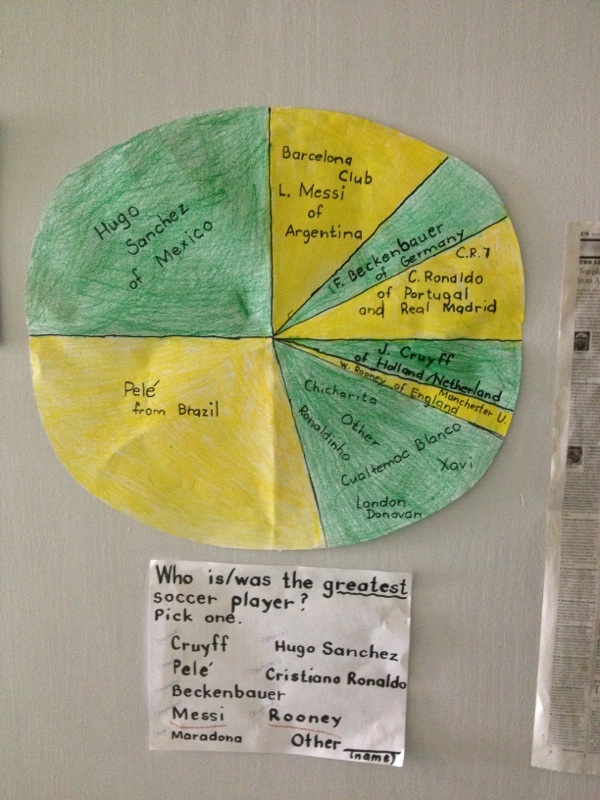 Ahn decided to “quiz” her students’ soccer aptitude by asking questions about club soccer in Argentina — using knowledge and information she had learned from a presentation by Alex Galarza, a Ph.D. candidate in history at Michigan State University and co-founder of the Football Scholars Forum. To her surprise, one of her students, Mauricio, was able to answer her questions with more information than she had remembered from the lecture. Mauricio, like many of the students in Ahn’s class, took an interest in the reading materials she brought with her from the seminar. Among her required reading assignments were an article and a couple chapters written by Goldblatt, as well as a brand-new copy of the book, Fútbol: Why Soccer Matters in Latin America. The book, written by Joshua Nadel, assistant professor of Latin American and Caribbean history at North Carolina Central University, had just been published and was given to all participants in the seminar. Ahn offered the reading materials to Mauricio to read after he completed his school work. In the weeks following her introduction of the materials, he was busy reading them. He also shared with Ahn that he had told his mother that he wanted to go to college be a “soccer studier” when he grows up. He even asked Ahn what university would be best, if he wanted to become one. Kerry Olinger, a history and English Language Arts teacher at Mark Twain Middle School, had a similar experience when she developed and implemented a unit in her seventh and eighth grade classes inspired by a chapter on women's soccer in Nadel's book. Students in Olinger’s class were asked to respond to the question, “To what extent has women's soccer been supported by society?” The assignment required them to examine eight sources of information including images, video and three excerpts from Nadel’s book. Students in Haydee Licari's English Language Development classes at Dana Middle School were "fighting over the book," she shared. Licari developed a lesson examining racism and soccer — an issue that is an unfortunate part of the game's history, and still impacts the sport today. Licari's students were highly motivated and inspired by the topics examined. They became interested in "fighting racism" and "learning about different countries and perspectives," she says. "My students just keep digging deeper and inquiring about the logistics and economic impact around the globe!" When Nadel, who had recorded a video message for the teachers that was played at the beginning of the seminar, was informed about how well his book was being received by seminar participants and their students, he was both humbled and enthused. True to Goldblatt’s word about finding a way to grab the attention of a room full of students and getting them interested in politics, economics and globalization, many of the participants — who teach subjects as diverse as math, government, Spanish, and world history — have discovered a topic through which they can connect with and engage their students. Students at Los Angeles Unified School District (LAUSD) schools just finished their last week of school. 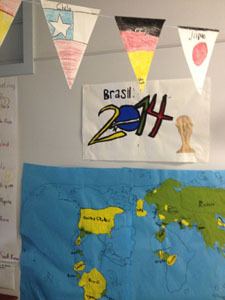 At Rita Santos-Oyama’s school, they finalized a six-week school wide project that required them to research and learn about the history of the game and the 32 participating countries in the World Cup. 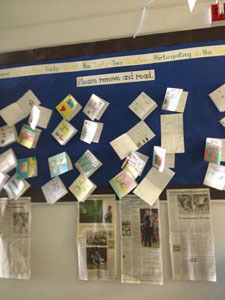 Other activities included math-related questions about the game posted in school hallways for students to analyze. In southeast L.A. County, students at Ahn’s school arranged a World Cup tournament among the 6th grade classes in homage to the end of elementary school. She announced Mauricio as the “Most Valuable Player” for blocking the final goal of the tie-breaker penalty kicks and decided to give him Nadel’s book as the MVP award. He assured her that he would read it over the summer. Soccer is more than a game, it is a global network and it’s a history worth studying.